After seeing Mr Doob's awesome boot splash animation, I started working on some animations. I got some great response on my "Ubuntu 9.10 Promotion intro" video and decided to created a suggestion for the Karmic graphical boot splash. I got a little carried away during the making of this clip (excessive use of effects - sorry!) and landed far far away from what the guidelines describe. Anyway, I've submitted the video for inspiration or perhaps even as a "don't go there" warning LOL. I've also been working on some more serious ideas, but I have nothing to show yet. I like the throbber I've added in the initial mockup below, but the two circles (throbber and Ubuntu logo) makes it kind of unbalanced. It's really a hard task to create something that follows all the design guidelines and looks slick. Thank you for posting an .ogv. Looks great indeed, very cool. About the "serious" bootsplash. 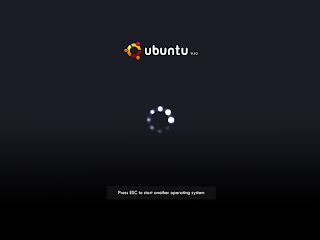 It looks good, but this dots and circle thing is also on the suse boot screens. Not that I don't like it, but just maybe good to know. thats awesome... you should try and get the "over the top" one included as an additional theme.